What Are Bitter or Lethal Almonds? Unlike sweet almonds, bitter almonds need to be processed in order to extract a sweet almond flavor. Without processing or cooking, raw bitter almonds can be lethal. Bitter almonds are a variety of regular, sweet almonds. Bitter almonds contain traces of prussic acid—also known as hydrocyanic acid—in its raw state. Hydrocyanic acid is a solution of hydrogen cyanide and water. The byproduct is an organic version of the well-known poison, cyanide. The worst symptoms of eating bitter almonds can include your nervous system shutting down, breathing difficulties, and even death. As few as seven to 10 unprocessed bitter almonds can kill a child, and roughly a dozen to 70 nuts can kill a 150-pound adult. The exact number depends on the size of the nuts. Bitter almonds lose their toxicity when cooked; nonetheless, the sale of the unrefined nuts is prohibited in the U.S. Bitter almonds are still used in areas of Europe and other countries. Bitter almonds are sold in pharmacies in Germany and are an ingredient in Christmas stollen, or Christmas fruitcake, made in Germany. Bitter almonds are used to make marzipan and cookies in Europe and can be used to make a kind of sweet syrup in Greece. Bitter almonds can be processed to make almond extract and almond-flavored liqueurs. When boiled or baked, the prussic acid leeches out. All almonds fall into one of two categories. Almonds are either sweet or bitter. Sweet almonds are scientifically called Prunus dulcis, dulcis being Latin for "sweet." You can scoop out a handful of sweet almonds and eat them on the spot. They might be crumbled and sprinkled atop desserts and other dishes. Commercially, they are harvested from farms in the U.S., Australia, South Africa, and the Mediterranean, where the nuts grow on trees. Bitter almonds also grow on trees, and they do not look much different from sweet almonds. Bitter almonds tend to be a bit smaller and have pointier ends. Bitter almonds usually give off a considerably stronger scent and are often used to make non-edible products like soaps or perfumes. They have a considerable saturated fat content. Bitter almonds are native to Asia and the Middle East but can grow in the U.S., and the trees are used ornamentally in landscaping. In the U.S., it is only the nuts that cannot be sold. Bitter almonds are scientifically called Prunus dulcis var. amara, the word amara meaning "bitter" in Latin. You are not likely to munch on a handful of bitter almonds because as the name suggests, the nut does not taste good. The nut is literally bitter, the result of growing to maturity within their shoots rather than blooming due to a recessive gene. This bitter taste comes from amygdalin, a chemical compound within the nut that defends the nut from being eaten in the wild. 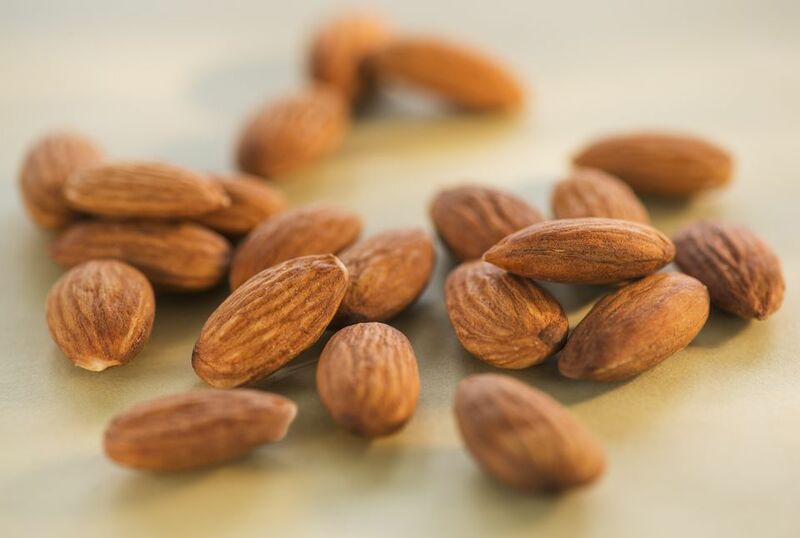 Amygdalin divides into two parts when exposed to moisture: an intense almond flavor that is actually edible, and hydrocyanic acid that makes the nuts deadly. Ironically, bitter almonds are reported to have medicinal uses in folk medicine. Bitter almonds are not sold or used commercially or pharmaceutically in the U.S. According to folk recipes, bitter almonds are said to help treat coughs, muscle spasms, pain, itching, and other conditions, although their effectiveness has never been proven in studies. In the 1970s and 1980s, an ingredient in bitter almonds, vitamin B17, was being investigated as a cancer cure. Several people traveled out of the U.S. to be given the vitamin B17 regimen only to die of issues related to cyanide poisoning. One of these people was famous American actor Steve McQueen.